Road to the Big Windmill is the first episode of Bianco Hills in Super Mario Sunshine, and is subsequently the first numbered episode of the game. The player should already have the Shine Sprite they've collected from the Delfino Airstrip, but that Shine Sprite was not part of an actual episode. 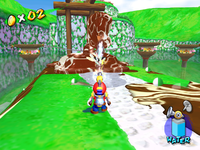 The episode begins with an introduction scene, which shows Shadow Mario standing near the bridge to the Big Windmill, next to a pile of Goop. The goal of this episode is to defeat the Polluted Piranha inside the Goop. The player needs to reach the countryside next to the lake. However, for this mission only, the gate to the countryside is closed to prevent any of the Graffiti from entering the village. While Mario cannot enter through the gate, he can get to the countryside in one of two ways: One way is by jumping over the wall the gate is a part of by using the buildings and ropes in the village to gain height. Another way is to simply follow the path along the wall to the waterwheel and move under it. Along this path, the player may encounter a Graffiti marking creating an endless supply of Strollin' Stus with a goop spatter on their heads. Spraying the marking will cause it to pop like a bubble. Once at the countryside, the player will find Graffiti all over the ground. Cleaning it up by spraying it with F.L.U.D.D. will cause trees to grow out of the ground. Following the path will lead to the Polluted Piranha, which is continuously sending Piranhabons rolling down the path. By spraying the pile of Goop, a Polluted Piranha will come out of it. Spraying the Polluted Piranha when it opens its mouth three times will defeat it, causing the path to rise up to the bridge and the episode's Shine Sprite will appear. Alternatively, Mario can choose to ignore the Shine Sprite and proceed to climb the Big Windmill and battle Petey Piranha (which is the objective of the next episode), making this one of the few episodes in the game that can be skipped. If Mario talks to a Pianta on the way up, the Pianta will say that Mario is getting ahead of himself. Ōfūsha e no Michi o Kirihirake! Clear the Road to the Big Windmill! This page was last edited on January 30, 2019, at 23:48.